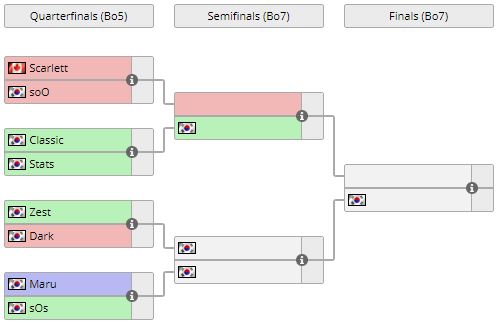 With the conclusion of the last two Ro16 groups, the elite eight of GSL Code S Season 1 have been determined. After a two-week break for the IEM Season XII World Championship, the GSL will resume on Friday, Mar 09 9:30am GMT (GMT+00:00) with quarterfinal matches. Game 1: GuMiho leapt out to a lead in the series with a cyclone/tank timing that overwhelmed a five base Classic's mostly stalker army. Game 2: Classic canceled GuMiho's natural expansion with two stalkers and a zealot, but nearly lost to a cyclone/bio counterattack off 30 workers. He held however, with a second immortal and a final warp in allowing him to even the series. Game 3: GuMiho's attempt to push out with bio and tanks killed five probes, but well timed stasis wards meant that he wound up 30 supply behind. All Classic had to do to close out the match was get storm and attack. Game 1: Two cyclones and a pair of hellions killed 32 of Dear’s workers in game one, giving Maru a swift 1-0 lead. Game 2: Maru's first attack on Neon Violet Square was repulsed, but he reloaded with more bio/mine/liberator. He crossed the map once again, this time obliterating Dear's paltry phoenix/adept army en route to the winners' match. Game 1: Classic forgot charge until Maru’s two base tank push was already at his doorstep, but he managed to buy enough time for the upgrade to finish. Maru was swatted back to his natural, down 30 supply. From there, Classic easily took the game. Game 2: Classic's proxied void ray and shield batteries went unscouted in game two, earning him a spot in the quarterfinals. Game 1: Dear and GuMiho were even up to 100 supply, but Dear made mincemeat of GuMiho's entrenched bio/tank army. From there he canceled GuMiho's third twice while sitting on four bases, leaving GuMiho with no choice but to concede. Game 2: GuMiho's cyclones and hellions killed 17 probes early on and. While Dear tried to respond with blink stalkers, two more cyclones appeared at his base, sending the match to a third game. Game 3: Dear had the bright idea to build three stargates in the bottom left corner of the map, but GuMiho scouted them with a liberator. Dear was able to get three carriers out before losing the buildings, but he lost his fourth base to tanks. He hung around for awhile, but GuMiho's mech was too much, setting up a TvT decider match. Game 1: GuMiho denied mining at Maru's natural with two tanks, but Maru broke out, evening the count at three bases to three. The players traded with bio/tank, but Maru was able to get a fourth base and reached 3/3 much more quickly, which put him ahead 1-0. Game 2: Maru held a worker lead after killing over 40 of GuMiho’s SVS, but he lost his third to a small drop. After some maneuvering, GuMiho attacked, pinning Maru on one base. Maru eliminated GuMiho's command centers, while escaping from GuMiho’s army with a command center and enough workers to fully saturate it. GuMiho tried to ferry tanks out of Maru's main, but lost them to marines and promptly left the game. Classic and Maru advanced to the round of 8. Game 1: Trap went for double disruptor production on Odyssey. Stats responded with zealots and immortals, but it did little to prevent Trap from whittled away at Stats’ army en route to a victory. Game 2: Trap threw a one base, three gate stalker, single phoenix build at Stats, but Stats built shield batteries at his natural and easily held, sending the series to a third game. Game 3: Having notched double digit kills with phoenixes, Trap's charge finished just in time to repulse Stats' counterattack. From there Trap won the match 2-1 by building up a superior immortal count which allowed his archons to get the better of Stats'. Game 1: herO and sOs both went for dark templars on Blackpink. herO lost his economy and sOs was reduced to less than ten workers, but in the end the game was decided by a few stalkers dueling against sOs' motley archon led force, a battle which sOs took down. Game 2: The players once again engaged in a basetrade, though it was sOs who escaped with nine workers before dropping a nexus. herO tried to charge up the ramp into what was formerly his main, but sOs blinked away and eliminated herO's last remaining structure to move on the winners’ match. Game 1: Having rebuffed Trap's dark templars, sOs killed 17 probes with a pair of oracles. From there sOs teched up to a mothership which allowed his army to roll over Trap’s disruptors and close out game one. Game 2: Both players safely teched up to two bases, but sOs's adepts killed 11 probes which set up a letal immortal/adept attack that hit before storm had finished. It was enough to finish off Trap which set up a quarterfinal match between sOs and Maru. Game 1: herO's gold base went uncontested on Odyssey, allowing him to overwhelm Stats with a massive tide of unupgraded charge zealots. Game 2: Stats evened the series with a one base stalker attack that ran over herO at his natural, despite the presence of shield batteries and phoenixes. Game 3: Stats and herO both powered up to over 100 supply, but a decisive fight in herO's natural saw the ROOT Protoss wind up 40 supply behind. herO clung to dear life, but the numbers were against him and he soon left the game, setting up a rematch between Stats and Trap. Game 1: After a series of skirmishes between adepts and phoenixes, Stats and Trap moved into a proper phoenix vs phoenix battle. Stats eventually forced a favorable engagement from the Jin Air Protoss near his third base that put him ahead 1-0. Game 2: Stats pushed into a two base Trap with an immortal, stalkers and a warp prism providing reinforcements. He rolled over Trap's defenses, earning him the victory and the final spot in the Round of 8 opposite Classic. sOs and Stats advanced to the round of 8. Friday, Mar 09 9:30am GMT (GMT+00:00): Code S will resume for the first two matches of the quarterfinals, with soO taking on Scarlett and Classic facing off against Stats. Dark is going to add a GSL to his achivements this year and get on his way to the 10 premier tournament he wants. The only one to have never been in a Starleague final is Scarlett. Would be great to get a Scarlett-sOs finals to mirror the IEM finals. If only INnoVation could've been in place of Scarlett...would be a sure fire win after beating him 12-3 in Wardiii's map tourney! All I know for sure is that if Scarlett beats soO she stands a real good chance at winning the whole thing. Maru is my terran hope though! Fighting~!! Why is everyone so confident in Dark? Either I'm out of the loop or you're all nuts. Ok soo, stomp scarlett, then classic or stats are doable and winnable, and go on to win the gold!!! Nooo, you jinxed it for soO! Such a stacked round of 8. This is going to be awesome to watch. Dark is potentially the best zerg in the world right now. Zest's PvZ is not particularly good. sOs's isn't looking that strong in the matchup either. Maru's TvZ looks very good still but is unlikely to make it past sOs.